A new study, “Debt Sustainability at the State Level in India”, by Balbir Kaur, Atri Mukherjee, Neeraj Kumar and Anand Prakash Ekka of the Department of Economic and Policy Research of the Reserve Bank of India (RBI), has found that, as of March-end 2013, a huge 17 per cent of the revenue expenditure of the Gujarat government goes into paying up interests on loan taken by it over the years, which is higher than most states. Suggesting that this is higher all 17 major states taken up for analysis, except West Bengal (20.9 per cent), the data suggest that Gujarat has progressively paid a higher proportion of interest on loan compared to most states ever since 1981. Thus, the study finds that between1981-82 and 1991-92, interest formed 10.3 per cent of the revenue expenditure of the Gujarat government, which was higher than six other states. Between 1992-93 and 1996-97, 15.3 per cent of the revenue expenditure went into paying interest, which was, again, higher than six other states. Between 1997-98 and 2003-04, once again, six states paid a higher proportion of revenue expenditure as interest. But things clearly changed thereafter. From 2004-06 to 2012-13, when ex-Gujarat chief minister Narendra Modi was at his peak, Gujarat spent 20.6 per cent of the revenue expenditure as interest on loans, which was second highest, next to West Bengal (20.6 per cent). 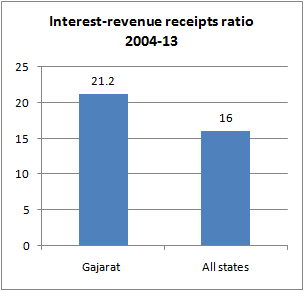 Worse, a further analysis suggests, from 2004-05 to 2012-13, 21.2 per cent of the revenue receipts, which the Gujarat government received as taxes and non-tax revenues, went into paying up interest on loans, which was higher than most states except Punjab (23 per cent) and West Bengal (24.7 per cent). The study underlines, there could be “a serious problem of intolerable debt in the long-run equilibrium” in states where the interest payments to revenue receipts ratio was “above the tolerable limit of 20 per cent.” Indeed, Gujarat is one of the three states which falls in this category. The study further finds that between 2004-05 and 2012-13, Gujarat’s debts formed 29.8 per cent of the Gross State Domestic Product (GSDP), suggesting that these were unsustainable. This was higher than seven other states, suggesting that eight other states, with a higher debt-GSDP ratio, also had similar unsustainable nature of debt. 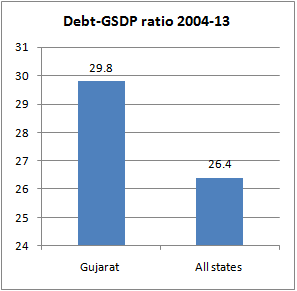 On the other hand, as many states had a lower debt-GSDP ratio, suggesting their debt was more sustainable than Gujarat’s. The study concludes that “the debt sustainability indicators showed significant improvement during 2004-05 to 2012-13 compared to the earlier phase (1997-98 to 2003-04).” But, clearly, as for Gujarat, this was not the case. Thus, between 1981-82 and 1992-93, Gujarat’s debt-GSDP ratio was 17.6 per cent and between 1993-93 and 1996-97 it was 19.9 per cent. It shot up to 30.6 per cent in the next phase, between 1997-98 and 2003-04, and in the last phase it went down marginally.